From the good 1990 vintage, this dark red coloured Spanish vintage red wine is an impressively endowed wine with an excellent bouquet of cedar, spicy oak, smoke and red and black fruits. With medium to full body and harmonious yet powerful flavours and moderate tannin in the finish. Drink now - 2023. 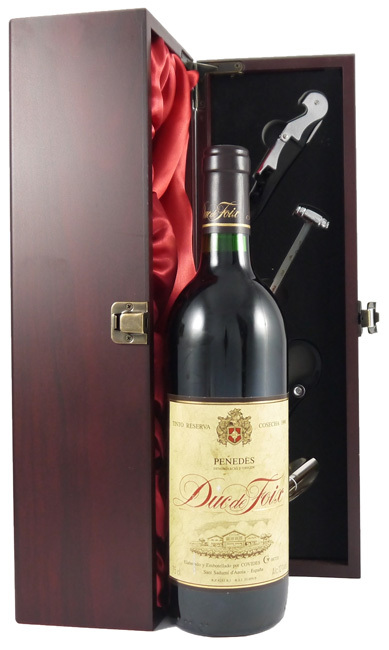 This vintage Spanish red wine is shipped in a deluxe silk lined wooden presentation box with four wine accessories (corkscrew, wine pourer, drip stopper & wine thermometer) [worth £17.99] at no extra cost and now includes a free gift card with your personal message and tasting and storage notes.